Well supported basal split dividing the family into two subfamilies. The Silphidae are among the largest and most conspicuous of the staphylinoid beetles. Most species are carrion-associated and will breed at carrion on which the larvae will feed. Adults of some (most?) species will opportunistically prey on fly larvae, and various species have been found at both dung and certain fungi. There are two distinct lineages or clades of silphids currently ranked as subfamilies. 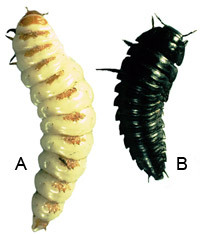 The Silphinae typically breed at large carcasses and show little to no parental care whereas the Nicrophorinae, in particular the genus Nicrophorus, show the opposite pattern. They breed at small carcasses (<300g, usually <50g) which a pair of parents will bury into a subterranean crypt in which to rear their brood. Members of the genus Nicrophorus are unusual among the Coleoptera in showing biparental care of their offspring. Some species have been found to breed communally on carcasses too large to bury. There is a relatively extensive literature on silphid biology, although primarily focused on the more behaviorally complex species of the Nicrophorinae, much of which has been reviewed by Anderson and Peck (1985), Ratcliffe (1996), Eggert and Müller (1997) and Scott (1998). Heymons published a series of classic works describing the biology of various European silphine species (Heymons et al. 1926, 1927, 1928, 1929, 1930a, 1930b; Heymons & Lengerken 1931, 1932a, 1933b, 1934). The life history of Necrodes surinamensis was described by Ratcliffe (1972) but few other silphine species have been studied in detail. See Sikes (in press) for more detailed information on silphid biology, morphology, and phylogeny. Dorsal view of the head and thorax of Diamesus showing the large scutellum. Image copyright © 2005 Derek S. Sikes. Larvae of A) Nicrophorus sp. 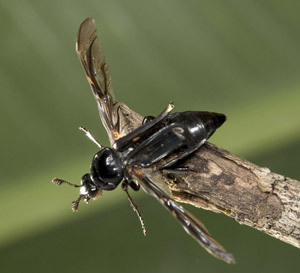 and B) Silphinae gen. sp.. Image copyright © 2005 Derek S. Sikes. Dobler and Müller (2000) used sequences of the genes COI and COII to infer the phylogenetic relationships for 11 genera of the Silphinae and 2 of the Nicrophorinae. Their results strongly supported the monophyly of two main clades in the Silphidae that correspond to the subfamilies Silphinae and Nicrophorinae and most included genera with the exception of Silpha (which was recovered as paraphyletic with respect to Aclypea). The Silphidae, as currently defined with only two subfamilies (Lawrence & Newton 1982), has been considered "undoubtedly monophyletic" (Hansen 1997). However, we cannot consider the monophyly of the Silphidae to be adequately tested at this point because we do not yet know what group is the sister lineage to the silphids. Hatch (1927) classified the silphids as a subfamily of the Staphylinidae near the Omaliinae but his classification did not gain acceptance. More recent works place silphids very close to, or tentatively inside the Staphylinidae (e.g. Lawrence & Netwon 1982; Lawrence 1982, Hansen 1997, Caterino et al. 2005) but many hypotheses remain unsatisfactorily tested. The consensus literature treats the group as a distinct family in a similar manner to the earlier classification of the tiger beetles as a family (Cicindelidae) that are now placed as a subgroup (Cicindelitae) within the ground beetles (Carabidae). All but the first of Hansen's proposed silphid synapomorphies (see Characteristics) are convergent with one or more of the staphyliniform ingroup taxa in his study; leaving only one unique character state supporting the monophyly of the Silphidae (subapical bulge on each elytron). Beutel and Molenda (1997) analyzed larval characters and found 3 of the 33 characters in their analysis to be derived (apomorphic) for the Silphidae, but none were uniquely so. There are a number of potential characters that have not been fully investigated which could prove to be synapomorphies of the Silphidae such as the pair of eggbursters on the hypopharynx of silphid first instars and the position in which adults hold their elytra during flight. Nicrophorus kieticus about to fly showing position that the elytra are held during flight. Image copyright © 2005 Derek S. Sikes. Anderson, R. S. & Peck, S. B. 1985. The Carrion Beetles of Canada and Alaska (Coleoptera: Silphidae and Agyrtidae). The Insects and Arachnids of Canada, Part 13. Publication 1778, Research Branch Agriculture Canada, Ottawa. 121 pp. Beutel, R. G. & Molenda, R. 1997. Comparative morphology of selected larvae of Staphylinoides (Coleoptera, Polyphaga) with phylogenetic implications. Zoologischer Anzeiger, 236: 37-67. Caterino, M. S., T. Hunt, & A. P. Vogler. 2005. On the constitution and phylogeny of Staphyliniformia (Insecta: Coleoptera). Molecular Phylogenetics and Evolution 34: 655-672. Dobler, S. & Müller, J. K. 2000. Resolving phylogeny at the family level by Mitochondrial Cytochrome Oxidase sequences: Phylogeny of carrion beetles (Coleoptera: Silphidae). Molecular Phylogenetics and Evolution 15(3): 390-402. Hansen, M. (1997): Phylogeny and classification of the staphyliniform beetles families (Coleoptera) Biologiske Skrifter 48: 1-339. Lawrence, J. F. & Newton, A. F., jr. 1982. 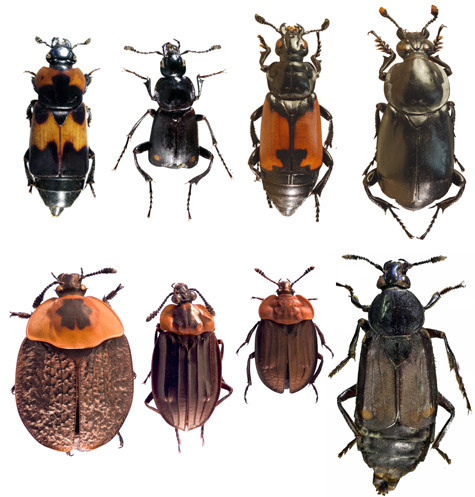 Evolution and classification of beetles. Annual Review of Ecology and Systematics, 13: 261-290. Peck, S. B. 2001. Silphidae Latreille, 1807 Pp. 268-271 in: R. H. Arnett and M. C. Thomas (eds). American Beetles: Archostemata, Myxophaga, Adephaga, Polyphaga: Staphyliniformia. Vol.1 Boca Raton: CRC Press. 443 pp. Nicrophorus Central: A website devoted to research on the subfamily Nicrophorinae. Four nicrophorines (from left: Ptomascopus zhangla Hava, Schneider, & Ruzicka; Eonecrophorus tenuicornis Kurosawa; Nicrophorus chilensis Philippi; N. concolor Kraatz) and four silphines (bottom row from left: Necrophila americana (L.); Oxelytrum erythrurum (Blanchard); Oiceoptoma subrufum (Lewis); Necrodes surinamensis (Fabricius). The following people contributed to the work on which we have based this web presentation. We thank them all for their advice, corrections, contributions of information, and support. Any errors remaining are our own. Michael Ivie, Ronald Madge, Piotr Naskrecki, Alfred Newton, Jan Ruzicka, Carl Schaefer, Chris Simon, Seizi Suzuki, and David Wagner. Many others, too numerous to list here, helped with specimen collection and museum loans, among other aspects of this research. Thanks go to M. Maruyama for his gift of silphid specimens from Japan, some of which we photographed for the images on these webpages. We thank Katja Schulz for her considerable help with editing and constructing this node of the Tree of Life. This work was funded in part by Grant DEB-9981381 from the National Science Foundation to Stephen Trumbo and Stewart Peck. Page: Tree of Life Silphidae Latreille 1807. Large carrion and burying beetles. Authored by Derek S. Sikes, Stephen T. Trumbo, and Stewart B. Peck. The TEXT of this page is licensed under the Creative Commons Attribution-NonCommercial-ShareAlike License - Version 3.0. Note that images and other media featured on this page are each governed by their own license, and they may or may not be available for reuse. Click on an image or a media link to access the media data window, which provides the relevant licensing information. For the general terms and conditions of ToL material reuse and redistribution, please see the Tree of Life Copyright Policies.